Deshna Mamgain did her Textile Designing from NIFT and after that she worked with NCDPD on Government Projects. She always wanted to promote the crafts of Uttarakhand, so she started a self help group and later formed an NGO by the name Kauthik. 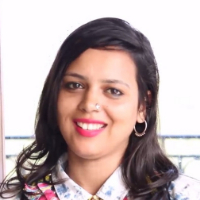 "After doing my schooling, I did Textile Designing from NIFT. Post that, I worked with NCDPD on Government Projects for some time. I always wanted to promote the crafts of Uttarakhand, so started a self help group and later formed an NGO by the name Kauthik."